NCTC’s 2016 Parides Professional Theatre Award goes to JTC! 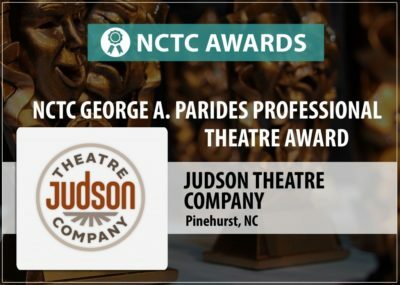 Judson Theatre Company is honored to be the 2016 recipient of the North Carolina Theatre Conference George A. Parides Professional Theatre Award. Each year, the North Carolina Theatre Conference Board of Directors presents the NCTC Awards to companies, schools and individuals that are active NCTC members and have exhibited leadership roles in their community, as well as artistic, professional or educational excellence. NINE BroadwayWorld Raleigh Award Nominations for JTC! BREAKING NEWS: Judson Theatre Company is nominated for NINE 2016 BroadwayWorld Raleigh Awards. JTC Friends far and wide–please VOTE and help us spread the word by SHARING this link to vote!